This herbed goat cheese tart is an easy, flavorful vegetarian dish that uses thin phyllo sheets as the crust. The filling is made with soft, mild goat cheese and cottage cheese, and it is topped with sautéed shallots and cherry tomatoes before baking in the oven. The secret to this main dish is the fresh herbs. You can substitute dry, but nothing compares to using fresh herbs! Once you take the tart out of the oven, sprinkle chopped fresh herbs all over for a finished look and extra flavor. Add olive oil to a skillet over medium heat and toss in the shallot and cherry tomatoes. Cook for 7 minutes, stirring occasionally. Set aside. Lay out at least 10 layers of phyllo onto a 9×13-inch baking sheet and spread butter between each layer. Add the cheese, eggs, flour, and herbs to a Magic Bullet blender and blend until well mixed. Pour the cheese filling over the phyllo sheets and top with the tomato shallot mixture. My youngest is the pickiest eater, so I have the hardest time giving her foods that not only fill her up, but also give her the nutrition she needs. She tends to lean towards the sweeter foods, so this coconut whipped cream sounded like the perfect addition to her diet! In the Magic Bullet blender, add the maple syrup and vanilla. Then open the can and scoop out the solid cream part, not the coconut water. Blend it until whipped and creamy! Keep refrigerated for up to 5 days. Salsa is probably one of my favorite foods to have on hand because I can cook with it! I love to bake chicken with it, add it to rice dishes, or just use it as a quick snack with lightly salted tortilla chips. This is a yummy green salsa that will have your taste buds going wild! 1 can diced green chilies, 7 oz. 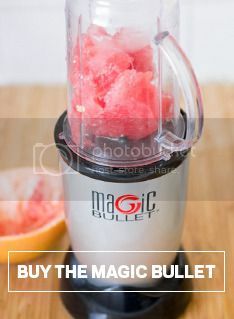 Add all the ingredients to the Magic Bullet Blender. Blend until creamy. Serve immediately, or store in the fridge for 3-5 days. Enjoy!